Today at 3.00 p.m. at the Intour hotel Syndica according to the regulations, there started the fourth FIDE Grand Prix chess tournament among men. When the players took their tables Vyacheslav Namruev, the Chief Arbiter in the presence of the organizers of the tournament in Nalchik, the leadership of Kabardino-Balkar Republic, Geoffrey Borg, CEO of Global Chess, visitors and the accredited journalists declared the competition open. 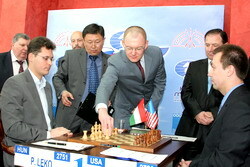 The right of the first move was given to Andrey Yarin, Head of KBR Government. He made a knight ’ s move on the chessboard of the American Gata Camsky and the Hungarian Peter Leko. After that guests and non-participants were asked to leave hall and the chess players got plunged into the games. The Competition is being broadcast online. Simultaneously, Boris Spassky, a renowned Grandmaster, the tenth World Chess champion is commenting on the games for the journalists and visitors in the Conference Hall. Live commentary of the games online is done by grandmaster Sergey Shipov.